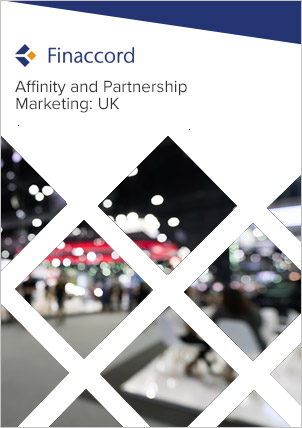 Finaccord's report titled Affinity and Partnership Marketing in UK Life Insurance, Retirement Products and Financial Advice represents the most detailed research ever undertaken on this sector. Drawing on the results of a survey of 2,555 organisations, the report analyses the penetration, operating models and provider share of relationships of affinity and partnership marketing schemes for protection-related life insurance, retirement products and financial advice across a range of distributor categories. These include: banks; building societies; charities; estate agency and property services firms; friendly societies; internet, media and telecoms entities; lifestyle organisations; professional associations; retailers; trade associations; and trade unions. Moreover, the PartnerBASE™ database that accompanies the report provides the granular detail behind the analysis, detailing each of well over 500 affinity and partnership marketing initiatives traced by Finaccord in this sector. In addition, the analysis identifies not only the providers of life insurance, retirement products and financial advice with the most partnerships (overall, and within each category) but also computes 'weighted provider shares of partnerships' in order to highlight the providers that are likely to hold the most valuable relationships given the characteristics of their partners. In this report, note that life insurance is defined as protection-related life insurance not explicitly related to loans including level and decreasing term life, critical illness, income protection (both long-term and short-term), over-50s plans, funeral expenses insurance and life savings insurance (offered for free to their savers by all credit unions). Hence, creditor (payment protection) and all forms of investment-related life insurance are excluded. Furthermore, retirement products are defined as including pre-retirement products such as personal pensions, SIPPs (self-invested personal pensions) and group personal or stakeholder pensions (but not occupational pensions) plus at-retirement products which are equity release products (sometimes referred to as lifetime mortgages) and annuities (including income drawdown). Meanwhile, financial advice is defined as the provision of advice in broad terms, potentially including the products listed above but also including more general advice about subjects such as savings, investments, tax and estate planning. It excludes cases where distributors only provide advice on their own products (or those of the wider group to which they belong) but includes those where distributors act as tied agents or offer restricted advice in addition to where they provide fully independent advice. plan your future affinity and partnership marketing strategy in life insurance, retirement products and financial advice armed with the best market and competitor intelligence available on this subject. Together, the report and PartnerBASE™ database will provide you with the definitive guide to current and potential affinity and partnership marketing opportunities in UK life insurance, retirement products and financial advice.